There should be no surprises about what the Russians have done. They have consistently made clear their support for President Assad. It was hardly a great secret that they had moved military assets into Syria - and the Russian pilots hadn't flown their fighter aircraft over to the Eastern Mediterranean to earn some extra air miles. President Vladimir Putin had a meeting with President Barack Obama on Monday night to explain what Russia's plan was - and although there were profound differences, US officials said they understood better what Russia's intentions were. Isn't there something totally jaw-dropping, gob-smacking, eyebrow-arching, ear twitchingly extraordinary - and not to mention, casual - about the way the Americans learnt about Russian plans? It began with a phone call from a Russian diplomat to his counterpart in Baghdad to say "we've got something interesting to tell you". Then a three-star Russian general leaves the Russian embassy compound and knocks on the door of the American one, and asks to see the US military attache. He tells the American military man that bombing starts in an hour, so you'd better get out of Syrian airspace now and move any assets you have off the ground. And 60 minutes later, the bombing started. Wow. To say the Americans were blindsided by this unorthodox line of communication is to put it mildly. Having had their "clear the air" meeting on Monday night there was an anticipation that though there might be big policy differences, there would be a degree of co-ordination and openness. Just consider this - the risks of a US fighter plane running into a Russian one with unimaginable consequences has just ratcheted up. Are they going to take it on turns to bomb targets? One day it's the Americans and their allies, the next day it's the Russians. You don't need to be a military historian to know that that is not going to fly (so to speak). And that is before we get to the strategic objectives. Are the Russians trying to destroy IS/Isis/Isil/Daesh or are they trying to prop up President Assad? The Americans see the two as very different, the Russians less so. On the evidence of one day's bombing it looks to be very much the latter. The target of Russian ordnance has been in places where IS has no presence. In other words, other rebel groups - any rebel groups - opposed to President Assad are being targeted. And that raises another huge question. What if the Russians start hitting US backed and armed rebel groups? That is not going to end well. And who knows how many US special forces there might be on the ground helping those rebel groups? What if they find themselves coming under fire - do they call in US close air support to see off their Russian attackers? The Americans clearly came away with the understanding after the Monday night tête-a-tête that they had an agreement on one thing - that IS needed to be attacked and destroyed, and disagreement on another - the role of President Assad in Syria's future political settlement. Well - and it is day one of Russian action - it looks like Russia is not distinguishing between different rebel groups. If these groups are against Assad, they could find themselves in the crosshairs of the Russian Air Force. Ashton Carter, the US defence secretary, says there is a danger that Russia is pouring gasoline onto the fire. He also insists there have been no big surprises in what the Russians have done today. Hmm. I don't think the Americans had the way today unfolded in their playbook. 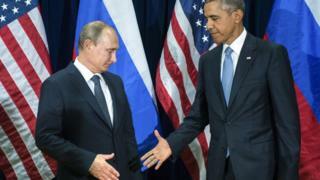 Once again Vladimir Putin has seemingly outmanoeuvred the White House. A senior US diplomat said to me the other day that when Obama leaves office he will be roundly applauded for the way he negotiated and ultimately delivered a deal on Iran, but will be justifiably vilified for the vacillation and vagueness over his Syria policy. Putin, on the other hand, has been totally consistent. He wants to protect Russia's only deepwater port on the Eastern Mediterranean and will do what it takes to protect it. So now it looks like the US administration has a choice to make - is it going to risk confrontation with the Russians, or is it going to accept that Assad ain't going anywhere and is there for the long haul? Not easy choices. The key argument of Obama's speech at the UN on Monday was "Choose co-operation over conflict. That is not weakness, that is strength." Doesn't seem to be Vladimir's modus operandi. The already intractable problem of Syria has just become a whole lot more complex - and a whole lot more dangerous.